Called "value," "cabin," "character," or "tavern" grade, factory seconds flooring includes hardwood with an abundance of natural marks or milling irregularities. In addition to the character of the appearance, the price of factory seconds flooring is a distinct advantage. Sold at 50-percent less than standard grade flooring, factory seconds often cost between $0.89 to $1.19 per square foot. On the other hand, factory seconds hardwood can be difficult to find, as many retailers do not carry these products. Distributors, such as Hurst Hardwoods and The Discount Flooring Co., receive monthly lists of which species or types of hardwood are being sold as factory seconds, and this selection often varies. The Timberland™ Collection by Bruce Hardwoods and Hartco and Robbins lines by Armstrong are some of the regularly-found value flooring brands. Hardwood often ends up as factory seconds when the appearance is not up to the manufacturer's standards. Several knots, mineral streaks, and color variation are common of factory seconds flooring. For the latter of these three, factory seconds hardwood may display other colors, such as greens and black, not found in higher grades. Other features of value grade flooring include splits, checks, and windshake in the face of the hardwood. In other cases, factory seconds hardwoods has milling irregularities, including voids on the bottoms, tree bark edges, missing tongues, or uneven corners. These features often make installing factory seconds difficult. If you plan to install value grade flooring, purchasing more than what you predict to need – at least 10 percent more – is recommended. Grading for unfinished and prefinished flooring can cause confusion for the consumer, particularly for the term "character." 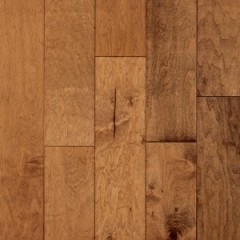 For unfinished flooring, character grade hardwoods are factory seconds. Character grade prefinished hardwood, however, is not, and even with visible knots and color variation, the wood is distressed by the manufacturer and, as a result, is priced higher. Prefinished factory seconds, on the other hand, are labeled as "#3 common flooring" before or after the finish is added.